The Martin MAC 2000 Wash has been produced for one main reason: the market asked for it. The Martin MAC 2000 Profile and MAC 2000 Performance have already been highly successful and to complement these, a washlight fixture in the Martin MAC 2000 Series was demanded. The Martin MAC 2000 Wash uses a 1200 Watt lamp at its source and features a brand new reflector, specially designed for this high powered washlight. 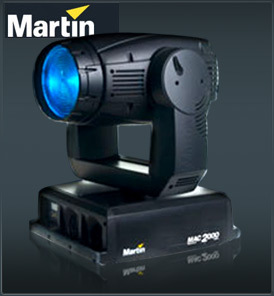 The Martin MAC 2000 Wash features full CMY color mixing along with variable color temperature correction filters. All of these variable filters work under the same principle as the previous MAC 2000 products, but they do feature a new etching design to ensure smooth and even color mixing across the entire beam. In addition we have added one very special feature to the zoom system, which now allows you to remove the zoom lens entirely from the beam to give a fixed, but extremely powerful beam. This function is automated and controlled completely by DMX.